The Maya culture that built San Gervasio and other Post-classic sites on Cozumel were sea-traders who plied their wares far and wide. The first recorded mention of their trade routes was in Bartolome de Las Casas’ abstract of the log of Cristóbal Colón (known by Americans as Christopher Columbus), where the discoverer recounted the events of his first voyage to the New World. 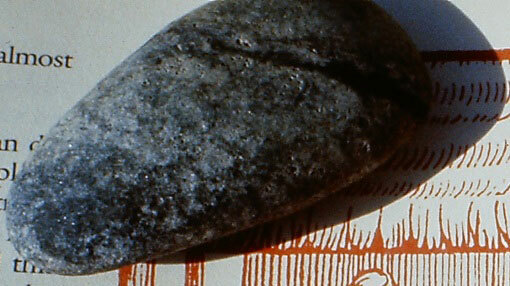 In Las Casas’ version of the logbook, it is stated that Colon came across a block of beeswax on the island of Cuba. At the time of the European discovery of America, the common honeybee (a native of Europe) was unknown in the Yucatan and the only wax-producing bees were the Yucatan sting-less bees (Meliponini beecheii and M. Yucatanica). Since these bees were kept by beekeepers only in Yucatan, it seems pretty clear someone over here was shipping beeswax to Cuba. • A Taino Indian vomit ladle (used to induce vomiting during ritual cleansing ceremonies) was found in a Classic Period grave at Altun Ha, in Belize. Since the Tainos occupied the Bahamas and the Greater and Lesser Antilles and were not known as traders, one would assume a Maya trader brought the ladle back with him to Belize from a sea voyage to one of those islands. • A cache of Pre-classic Maya jadeite axes, or celts, was found in the 1990s on the Island of Antigua and traced back to the origin in the Motagua valley in Guatemala (1,800 miles away) by mineralogist George Harlow, of the Museum of Antigua and Barbuda in St. John’s, Antigua. • A group of Maya pottery shards and obsidian implements were found on the western tip of Cuba by Maurice Ries in the 1940s. 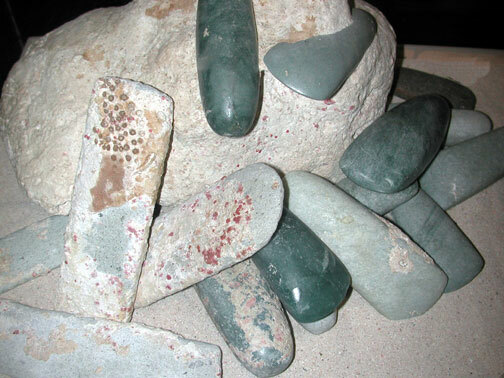 • I personally found a jadeite celt (that originated in Guatemala) on a small islet near a Spanish shipwreck off Highborn Cay, Bahamas, which I was excavating with the Institute of Nautical Archaeology in the 1980s. It is shown on the right. So if the evidence is out there in the Caribbean that proves the Maya were trading their goods (and trade-goods they acquired elsewhere) with far-away lands, is there evidence that points to where they were sailing from with their large trading canoes? There is, and it points to the fact that they were sailing from right here in Cozumel. First, in our very own Cozumel museum, one can see firsthand the two Olmec objects (a carved jadeite pectoral, and a carved stone pendant) that were excavated in San Gervasio during the 1970s by Jeremy Sabloff and William Rathje’s teams from Harvard and University of Arizona. Admittedly, it is possible that these items came into Quintana Roo via an unknown overland trade-route, but the sea-trade route that followed the coast all the way from Tabasco to Cozumel makes more sense. Second, the only two known Maya shipwrecks were both discovered right here on Cozumel. The first was discovered by Ismay (Mary) Mykolyk (better known in Cozumel as “Maria la Bandida”) at Chen Rio, on the eastern side of the island. While diving, she noticed several jadeite celts and beads in the sand of the ocean floor. Further investigation lead to the discovery of more embedded in the fabric of the reef. Through careful excavation of the area, more of the artifacts were found. Some of these are now on display in our Museo de la Isla. Another Maya canoe wreck-site was discovered near a small ruin on the northeastern side of the island. This time, it was the result of a hurricane that led to the discovery; the ruin on shore was destroyed, but the storm uncovered the cargo of the wreck just offshore, again jadeite celts and beads.